Moving ahead in his journey to discover the real India – Pt. Nehru reaches to a point where the possible formation of Caste should have taken place (while writing his book – Discover Of India), and he collects his thoughts on the same. 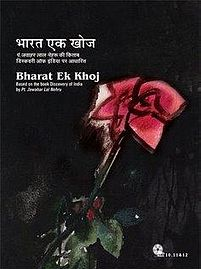 The TV serial – Bharat Ek Khoj – directed by Shyam Benegal focuses on the same. Actually the Rigveda (pronunciation: Rugved) contains hymn titled as Purusha sukta (puruṣasūkta, पुरुष सूक्तम्). It is about the Adi Purush or Cosmic Being or the One (the root). You can get to know little more about Purush Sukta from here. Considering the spiritual unity of the stuff in the cosmos, it is considered to be a man (Purush). It is said that from the mouth of the Purush – the Brahmins have came. So their responsibility is to take care of the knowledge collected so far, preserve it and pass it to the next generation. So the treasure of the knowledge keep growing and passing to every generation by its previous generation. This is the work of highest responsibility and hence Brahmins are required to be the person with a lot of good attributes and qualities. And as they do take care of the most precious treasure of the mankind, they were respected by the others, and main duties of the Brahmins was to teach, provide wisdom oriented services and do rituals. And in the interest of the same, they were served by the other segments of society for livelihood so they can perform their duties properly. From the hands of the Purush, there came the Kshatriyas. Every society needs administration and security. No wealth can be secured without power, discipline and force. Kshatriyas therefore given the responsibility to take care of the society and its resources. They have given the power to perform the same. They had to be into the wars for the same and hence they used to possess more war skills and physically fit then others. As the society is a segment of people and the interaction between them is necessary. This inter-dependency lead to various kind of businesses and trades. Which started liquidity of wealth and resources. To do so, one needs good skills of management and business. Vysya (Vaishya) – came from the thighs of the Purusha, have exceptional skills in trade and aspects related to the same. There needs to be other duties to perform. There needs to be the people to do work at the grassroot level. Everyone cannot be commander in an army or captain in a team! Shudras therefore came from the feet of the Purush and are very hardworking in nature who can perform the basic duties skillfully (which includes but not limited to unskilled labors). There is no way to consider Shudras (and for that matter any other caste) a level below then others. See, the mouth, the hands, the thighs, the feet everything is important at its level. And we never consider any body part less important. Same way all the segments of the society are equally important. And together they all, makes a healthy society. The original Indian culture was attribute based and not the birth based. Even inter-cast marriages took place those days. However over the time, the caste mechanism became birth based and it somehow became curse for some people (rather than being boon, as the original idea behind the caste-segmentation). Especially the handover of power from one generation to other (from the king to his eldest son – mostly) make the things probably worse – especially when the successor is not possessor of the qualities needed. The Aryans initially settled into very northern segment of Hindustan and its neighborhood; which they called Brahamavart (Currently Afghanistan and its neighbor areas). Later they came to the banks of Ganga, Yamuna and other revers and started calling it AryaVart. Naturally the like the other civilization, the Arya civilization is also developed on the banks of rivers. Possibly the caste were formed initially to separate the Aryas who were immigrants from the Dravids – the actual natives. The episode refers incidents from Ramayana and Mahabharata, as well. There also a complicated story about “a son of three fathers” referred in the episode. All these tales/stories try to explore the actual structure of cast and its effects on the society in those days. This episode not only tries to explore the possible philosophies of those days and the structure of the society but also makes us to thought about the same. May be everything we can find about the past is not ideal but chances of it to be factual are more. With less resources, but nice acting performances this episode becomes a good watch. Of course, the background music, dialogs, story and screenplay are the other positive points of the episode. Our personal suggestion : go for the episode.